Allow users to install Microsoft Windows desktop access points to Google Docs, Calendar and Gmail that are pre-configured to work with accounts on your domain. These apps launch in a streamlined Google Chrome browser window. This update also allows users to set Gmail as their default email program. As you can see, you can reset the PIN, Ring the device if you loose it in the house and lock the device. 3) Follow instructions to install the Google Sync software. 4. Select Microsoft Exchange. 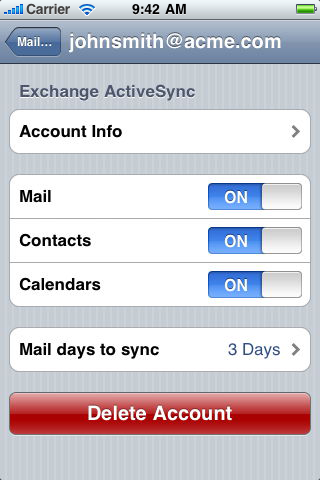 iOS 4.0+ allows multiple Exchange accounts. 5. In the Email field, enter your full WebMadeEasy Account email address.ou may see an "Unable to verify certificate" warning when you proceed to the next step. 7. Enter your full WebMadeEasy Account email address as the Username. 8. Enter your WebMadeEasy Account password as the Password. 12. Select the Google services (Mail, Calendar, and Contacts) you want to sync. To receive and respond to meeting requests on your device, both Mail and Calendar need to be turned on, and New Invitationsneeds to be enabled in your Google Calendar settings. To enable New Invitations, sign in to your Google Calendar using the web browser on your phone or computer. Go to Calendar Settings > Calendars > Click on the Notifications for the calendar you want to sync. Under Email check New Invitations (and any of the other Invitation settings you want enabled), and click Save. If you want to sync only the My Contacts group, you must choose to Delete Existing Contacts during the Google Sync install when prompted. If you choose to keep existing contacts, it will sync the contents of theAll Contacts group instead. If there are no contacts on your phone, the latter will happen -- the contents of your All Contacts group will be synced. You've set up Google Sync! Synchronization will begin automatically if you have Push enabled on your device. You can also open the Mail, Calendar, or Contacts app and wait a few seconds to start a sync. The Google Apps Sync download includes Google Apps Migration for Microsoft Outlook to import existing data to Google.